Everything has a cycle, even guides for a video game. Back in the day, guides and opinions were everywhere and hard to find – if you didn’t know the name of the fan-site for your class, you didn’t know where to go. After years of this, we all just wanted a way to get everything in one spot, regardless of the class. So sites like Noxxic and Icy-Veins were born. With each expansion, guides have gotten even more consolidated – to the point that many of the Icy-Veins and WoWhead guides are written by the same person, who also happens to run the class Discord. While this consistency has the advantage of giving you confidence in making a decision, it has a downside as well: a lack of diversity for alternative, viable ways to play. 96% of players surveyed want guides to offer more choices. We want to show you multiple ways to play that are also good enough to get you a top rank. We do this by sharing data so that you can make an informed choice. Sharing data also has some side benefits: it improves build customization and helpful interactions between teammates. Each section of our guide draws from those things, and we hope you find them helpful. 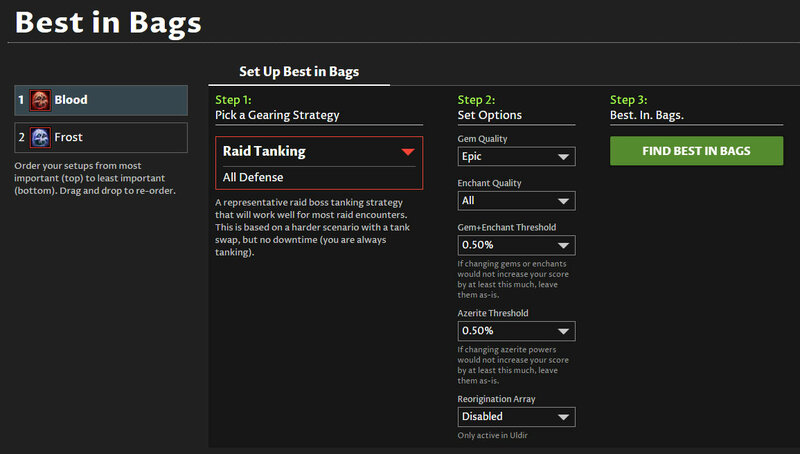 You can check our our new World of Warcraft guides here. But if you have some time to spare, keep reading this post for more in-depth information, a mini video about the Talent Build compare tool, and an overview of the rotation flow charts. Update: We have made some UI improvements, outlined in this forum post, mostly around the talent tool. Thanks for everyone’s initial feedback so we could make it more clear. Now that we’ve gone a full raid tier without officially having Master Loot, how do people feel about it? 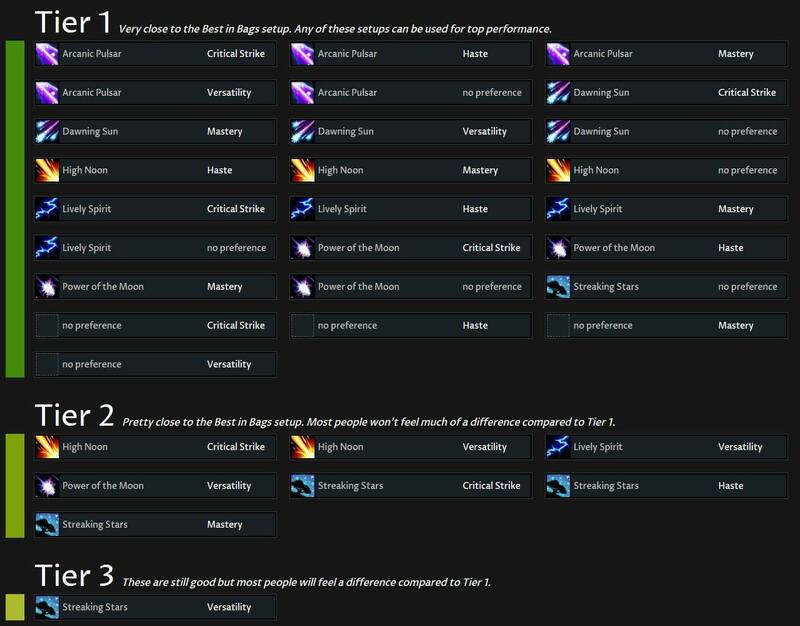 How have teams adapted Personal Loot systems to fit their team? What is the popularity of each loot system? Are people happy with their team’s loot system? How do people feel about the iLevel and bonus roll trade restrictions? Mr. Robot wants to make sure you are ready for Uldir and help evaluate all of the new drops you’ll be getting. So he’s making all of his premium features free Monday, Tuesday, and Wednesday, Sept 3-5, 2018. When we say free, it’s simple & fair. You get to use every premium feature without ever entering a credit card. You will need an account so we can save settings (which is necessary for some of the features), but we will never email you marketing stuff. Ever. Not even after the free stuff is over. There are a lot of ways to effectively heal your team and keep your teammates alive. Healing simulations let us experiment with different styles of healing and determine which ones can keep a team alive. Simulation also lets us compare the potential healing output of these different styles. Ultimately, any style that keeps everyone alive is equivalent for all practical purposes, but it is fun to also try to maximize the healing per second. How to determine the best ways to heal? A tool like this makes it possible to test different ideas with each class and quantify the results. You’ll see us doing that a lot and pushing healing theorycraft into a new frontier. Okay, maybe that’s overstating it a bit, but you will see us discovering non-traditional ways to heal that work as well as the popular styles. We’re excited to share these with you and break a few traditional rules without sacrificing your ability to keep people alive. Let’s look at an example set of rotations for Holy Priests to demonstrate this. Holy Priests have really strong AoE healing, so ‘rotations’ that focus almost entirely on AoE are quite popular. Even though their AoE is so strong, we wanted to see if a mix of AoE and spot healing could stand up to the power of a rotation focused mainly on AoE. To test this, we set up a rotation for each style in the simulator. All AoE healing (see rotation): uses Prayer of Healing liberally to keep the raid topped up, only using single direct heals if a player is in a lot of danger. Mix of AoE & spot healing (see rotation): makes good use of the single target, mana-efficient spell, Heal, when there isn’t a lot of danger to the raid. The spell usage for each rotation is significantly different. But they both end up with the same healing effectiveness. This example was particularly surprising. 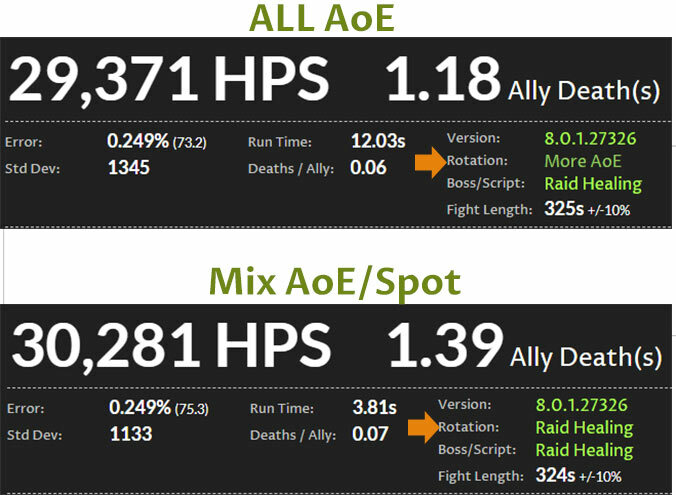 Most people (including us), wouldn’t have expected the Mix AoE/Spot healing rotation to be equal to (or surpass) the power of the AoE-focused rotation. But we tested it anyway and found another viable way to heal. We approach rotations with no pre-conceived ideas of what “should” be the best way to heal. We know what’s popular and already working, but we like to keep an open mind to other possibilities. We experiment with and test any and every idea we (and our users) think of. Once we find something that keeps everyone alive, we also try to maximize the potential HPS. Our thinking is that we will give more flexibility to your raid team to absorb mistakes, like standing in blood pools during fights. We generally avoid extremely ‘specialized’ healing styles for our own theorycraft since most people don’t play Warcraft at a level where they can just have one very specific healing task in the fight. Most healers have to be a “jack of all trades” in their raids, sometimes AoE-ing, sometimes spot-healing, and sometimes hitting that darn emergency button. I talked a lot about measuring the effectiveness of different healing styles. That means we need some metrics in order to compare them. Let’s dig into those a bit more. HPS (Healing per Second). Most of us healers have a love/hate relationship with this metric. It’s actually a very good metric for measuring total throughput (how much total healing can you do?). That’s a great number to have. But it’s gotten a bad reputation from people abusing it by healing specifically to top the meters. When someone tries to cheese the system, they knowingly snarf heals and use big cooldowns before anyone else so they can keep their healing numbers high. (I previously reported on this over at Blizzard Watch, if you are interested). They are focused on topping the meters, rather than healing the right target at the right time. But the simulator isn’t trying to cheese the meters, so it removes that factor from the equation, making HPS a great way to quantify healing. Another way to measure healing is to figure out what results in the least deaths. We call this “Ally Deaths” on the simulation reports. Our goal is to help you select talents, gear, and answer any other questions in a way that results in the least number of deaths. The simulator knows how much mana each spell costs. It knows your Global Cooldown (GCD) and how much your cast times are reduced by Haste. It knows when a proc happens making your next heal spell free, and so on. The simulator knows how much mana you started with and how much you have throughout the fight. This allows the simulator to cast spells, use up mana, regen mana back, and continue just like you would in a real boss fight. It can even execute logic that triggers certain spells or trinkets if you have less than (or more than) a specific amount of mana (like an on-use trinket that restores mana). The impact of high-Haste builds: if you are running out of mana, more Haste isn’t going to help you as much as Mastery or Crit would. Mana trinkets: if you are running out of mana, a mana trinket might be your best option over one that does extra healing. Mana-efficient heals: you can determine if more mana efficient heals would result in more healing until you get better gear. Mana also factors into your ‘healing style’ choice. If you heal too aggressively, you run out of mana. If you are too passive, people die. Simulations help you find that balance. Simming healers requires a much more complex system than DPS. I hope I covered enough details to answer all (or most) of your questions. If you want to discuss anything about healing sims, or have any remaining questions, head over to this forum thread. If you are excited to test things out on your own healer, head over to the simulator and load your character. Lastly, we’re always testing ideas on fun, effective ways to heal. We post some of the more interesting findings in articles. If you want to be notified when those come out, sign up for my email list. I personally write every email and I promise to never include promotions or spammy things. I send 1-4 emails a month, depending on how much we have to share.